YouTube added a clever option for those who want to see a better video quality in full screen. If a video is available in a HD format, you can view it in HD when switching to the full screen mode. 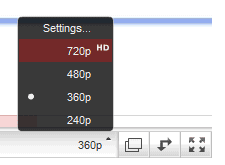 Just click on the drop-down menu for switching between formats, click on "Settings" and enable "Always play HD when switching to fullscreen (when available)". You can also change playback quality settings from this page. That option does not works with the 460p resolucion. Every time that I swith into full-screen mode, the resolution of the videos changes from 360 to 480, and I do NOT want these, because my internet conexion is not as fast as the video, and I have the swith mannually. It's frustrated. If you don't have a fast Internet connection, don't enable this setting. HD videos are quite large. I think it's a good thing that YouTube switches to 480p if there's no HD version. Videos look much better in full screen. I get the same message. I've tried tweaking the settings on our corporate firewall (SonicWall 3060) and cannot for the life of me figure out why I keep getting the "video no longer available message." When I view the same video outside of our corporate firewall, i.e. on my home computer via LogMeIn, the video plays fine with no messages or problems. Can someone tell me how I need to tweak my SonicWall? SonicWall support has been no help, so I'm looking for someone who has personally fixed this issue. On the balance I prefer it not switching back to the lower quality version when exiting fullscreen. At least it means the video can continue to play uninterrupted. When Youtube switches video quality, you get a delay as well as a desynchronization of your exact position in the video. The delay when switching to HD upon entering fullscreen is not too annoying, but because of how Flash's fullscreen works, if you need to switch windows temporarily you have to exit fullscreen. If entering/exiting fullscreen always required a quality switch delay that would get annoying.